It’s a bit of a dilemma – you need to promote your products, services and latest offers on Instagram because you need to get ROI (return on investment) for all the effort you put into your account. But, you can’t promote too often or else you’ll bore your audience to tears. 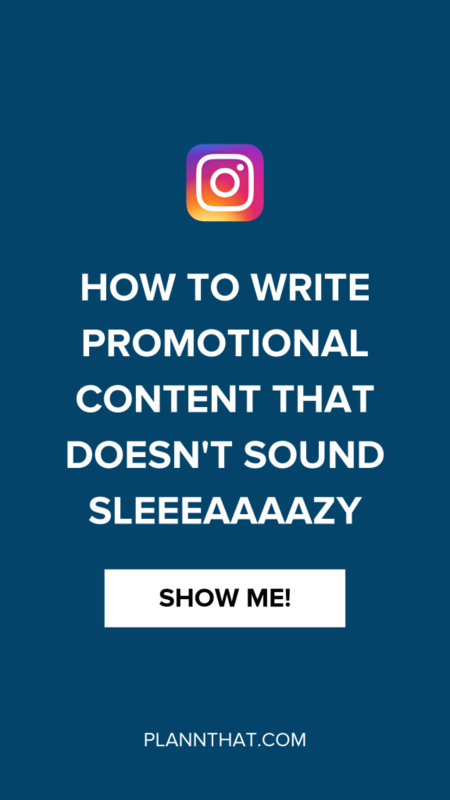 Today we’re going to walk you through a few techniques we use to keep our promotional content sleaze-free. You aren’t a used car salesman, are you? You don’t have to push for the hard sell or bully your Instagram followers into buying your products – that strategy is never going to work on Insta, let alone social media! We recommend breaking down *what* you post on Instagram into four different content categories to make it easy to create a strategy that works. Pro Tip: I recommend posting more Educational content than anything as that tends to be the most valuable type of content for audiences of a service-providing business. However, if you run an e-commerce or product-focused business or blog, you should focus more on Conversational content. By following along with a content strategy that has variety, you’ll not only increase the power of your promotional posts – your audience are likely to become more engaged! What a bonus! Writing captions that are blatantly promoting your stuff can feel really gross, but don’t freak out! After providing your Instagram followers with so much value through your educational, motivational and conversational content they will really *want* to know what you have to offer them. Here’s a few writing tips you can put into practice to create promotional captions that help you to increase sales without feeling like a grub! – Keep your promotional captions short – 1-3 paragraphs max! The sad news? ⠀⠀⠀⠀⠀⠀⠀⠀⠀ All February workshops are sold out, and have been since mid-January. ⠀⠀⠀⠀⠀⠀⠀⠀⠀ The good news? March dates are online now, and already *selling* [especially our advanced Get Social Savvy date]. ⠀⠀⠀⠀⠀⠀⠀⠀⠀ The best news? All of our workshops are available with OxiPay, so you can workshop now and pay later [in x4 interest-free / cash flow sympathetic / accountant-approved instalments, ha! Want some more business tips like this? Let us know! Send us a DM on Instagram at @plannthat and we’ll make sure to whip something up. PreviousPrevious post:Case Study: How We Gain 800+ New Followers a MonthNextNext post:It’s Time to Grow Your Instagram Followers!